'Science Comics: The Brain' review – AiPT! The most complex organ, made understandable! 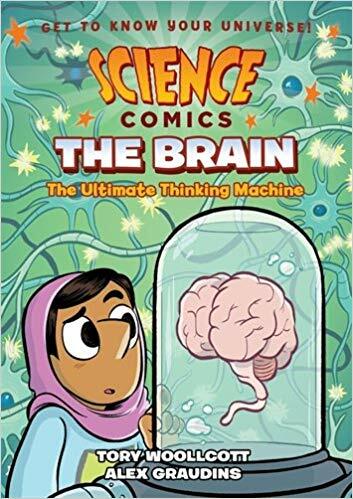 Releasing on October 16, The Brain is the latest in First Second Books’ Science Comics series. So what do we think of this comic? The structure of The Brain (the book, not the organ) uses a simple, if slightly silly story to frame all the information. It actually does a very good job of providing examples of some of the concepts that it’s explaining, especially when illustrating how memory works. The subject matter is pretty diverse, covering ancient history, basic evolution, biochemistry, cell biology, physiology and even studying techniques. Writer Tory Woollcott covers pretty much every aspect of the brain (except for developmental biology) and does a good job of ensuring that everything is explained clearly, without going into too much depth. Concepts are broken down into easy-to-understand parts, and the use of humor and the slightly silly setting keeps things from getting too dry. While the writing is good, the illustrations are crucial here. Even in textbooks you need illustrations to help deliver this much detail and information, and Alex Graudins’ are exactly what this book needed. Almost everything is clear, easy-to-understand, and well-defined. The character work for the story elements is very expressive and energetic, and the cartoon style used to depict neurons, neurotransmitters and the “fight or flight” response is very clever and adds a little character, while still being very close to the diagrams, which are clearly drawn and labelled. Science Comics: The Brain is an informative, easy to understand and cleverly done comic. It covers every aspect of the brain that you would hope it to, without coming across as too dry. The illustrations in particular make this a great choice for helping kids learn more about the brain. Science Comics: The Brain is an informative, easy-to-understand and cleverly done comic. It covers every aspect of the brain that you would hope it to, without coming across as too dry. The illustrations really help in making this a great choice for helping kids learn more about the brain. Great use of the framing story to explain memory and learning. The book covers almost every element of the brain. Both the illustrations and diagrams are great at clearly getting across the information. Some chapters or breaks would have helped as there is a lot of information to handle all at once.